Louisiana’s vibrant culture and its diverse industries make it an appealing place to live and work. For individuals who wish to enter the workforce with a vocational certificate or degree, there are a variety of career opportunities in fields such as energy, health services and business administration. Louisiana is one of only a handful of states to require all high schools to offer at least one vocational program, which means students can get a head start on their careers or better prepare for programs at community colleges and technical schools. Read on to learn about the advantages of completing a training program and what jobs are available to those earning vocational and trade education. Students in Louisiana can enroll in any number of the state's vocational or trade schools. From community colleges to trade academies, students can study to work in any one of the growing segments of Louisiana's economy, including construction, healthcare and office support. Students interested in learning how tuition, financial aid, breadth of programs and the like about certain colleges stack up can read through our rankings of accredited Louisiana schools. Students can choose from seven academic divisions and more than 100 degrees, certificates and technical competence areas. Degrees include Associate, Associate of Arts, Associate of Science, Associate of Applied Science and Associate of General Studies. The school also offers an Accelerated Career Education program, and some students may qualify for credit for prior learning, or "non-traditional credits." These credits may come from military experience, credit examinations, College Board AP credits or advanced placement credits. High school students interested in early enrollment can apply for admission at the end of their junior year. The main campus of Central Louisiana Technical College is Alexandria, but the Ferriday, Ward H. Nash Avoyelles, Lamar Salter, Huey P. Long, Oakdale and Rod Brady campuses are also accredited by the Accrediting Commission of the Council on Occupational Education (COE). The college offers a wide range of associate degrees, industry certifications and technical diplomas, and maintains academic partnerships and articulation agreements with the following three- and four-year institutions: Upper Iowa University (UIU), Louisiana State University of Alexandria (LSUA) and Northwestern State University (NSU) in Natchitoches, La. Graduates can seamlessly transfer after earning a two-year degree from CLTC. Northshore Technical Community College has six campuses spread across the area east of Baton Rouge and North of New Orleans, each of which is accredited by the Accrediting Commission of the Council on Occupational Education (COE). Connect to Success, the school's instructional service center, works closely with some students to provide seamless transfer to Southeastern Louisiana University, while offering them access to some of the university's resources while they are still studying at NTCC. The YouthBuild program helps non high school graduates between the ages of 16-24 gain access to college, and the college maintains Open Campus, an educational and community resource available to all students. South Louisiana Community College has eight campuses, which offer both evening and daytime classes. Two-year degrees prepare students for direct entry into the workforce, or credits earned can be used to transfer to any four-year school in the country. The school offers a Transfer Degree Guarantee (TDG) program, which provides guidance to students seeking to transfer. TDG guarantees that an associate degree with at least 60 credits and an average of C or above may earn a student a spot in any public four-year university in Louisiana. There are five academic divisions that, depending on the campus, include dozens of majors. Northwestern Louisiana Technical College maintains campuses in Minden, Natchitoches, Mansfield, Shreveport and Many. The open-admission college requires prospective students to take the COMPASS Placement Test to determine course placement unless they provide valid ACT or SAT scores. Most programs require students to participate in and complete an orientation program called ORNT 1000: Freshman Seminar within their first two semesters. Former students may re-enroll within five years of previous enrollment. Each campus has its own student government association, and the college maintains a National Technical Honor Society, SkillsUSA and Phi Theta Kappa organizations. There are 13 schools or programs in Louisiana offering vocational and trade certificates in several areas of study. If you wish to improve your skills in one of Louisiana’s fastest growing fields such as health sciences, business administration, or computer support services, use the search tool below to find a program near you. There are 13 community and technical colleges in the state of Louisiana – eight of which have been ranked in the top 100 producers of one-year certificates, and five have been ranked in the top 100 producers of two-year certificates. In Louisiana, 92 percent of high school students enrolled in career and technical education programs graduated, and 90 percent met performance goals for technical skills. According to the U.S. Department of Education, there were 168,540 career and technical education students in Louisiana, including secondary, postsecondary, and adult education programs in the 2013-2014 school year. According to the State of Louisiana’s Division of Administration, some of the state’s largest industries include: oil and natural gas production, tourism, commercial fishing, and biotechnology. According to the Louisiana Economic Development, the state’s key industries are a mix of those that have historically supported the economy, as well as new and emerging industries. The current workforce is attracting businesses in the fields of advanced manufacturing, aerospace, energy, and more. Core industries such as education, healthcare, and legal services are also continuing to grow. There are numerous opportunities in each of these fields for individuals with certificates and diplomas below a bachelor’s degree. For students considering a vocational or trade certificate, refer to the chart below to see how prospective occupational fields compare in terms of job openings, anticipated growth, and salary. New Orleans’ economy is supported by four major industries: oil and gas, tourism, the port and ship building, and aerospace manufacturing. Some of the city’s largest employers are shipbuilding firms which build and repair vessels for the U.S. Navy, and manufacturers of aerospace components for NASA space programs. The New Orleans Business Alliance is an economic development agency working to grow the city’s economy by focusing on further development in six industry clusters including advanced manufacturing, health services, creative digital media, sustainable industries, transportation, and retail. Many of these industries offer job opportunities for individuals with vocational certificates or diplomas. In New Orleans, students interested in health sciences can find accredited programs through A&W Healthcare Educators or Cameron College, which offer certification in fields such as nursing assistant training, phlebotomy, and medical insurance coding. Delgado Community College, a larger school with 17,152 students, offers 17 programs with specialized areas of study like engineering technology and culinary services. To meet the state-wide demands in service-focused industries, both Park Place Premier Barber School and Stevenson Academy of Hair Design offer various certification levels in barbering and cosmetology. A resource for student and teachers at all levels, including a list of vocational programs and tips for preparing for college. Created by the Louisiana Office of Student Financial Assistance, it supports students throughout the state by providing guidance for students and families around college and career planning. A resource for dental hygienists that provides continuing education opportunities, legislative updates, and hosts an annual conference. Provides support and resources to radiology students and professionals through continuing education, job boards, meetings, and recognition. This organization advocates for nurses of all levels and specialties. It provides support with information, representation, protections, and career opportunities. 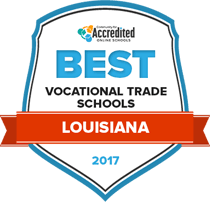 Provides an overview of vocational and trade programs, including types of education opportunities, areas of study, financial aid information, and credit transfers within the state of Louisiana.